BCL-2 Pathway: APG-1252 (Bcl-2/Bcl-xL dual inhibitor) or APG-2575 (Bcl-2 selective inhibitor) can compete for the binding of pro-death proteins with Bcl-2 or Bcl-xL (dual inhibitor only), thus triggering the downstream cascade of BAX/BAK oligomerization, cytochrome c (Cyt c)/SMAC release from mitochondria and caspase activation, leading to cancer cell death (apoptosis). AT-101 is a pan Bcl-2, Bcl-xL and Mcl-1 inhibitor which can neutralize the anti-apoptotic function of these proteins and trigger the downstream cascade of BAX/BAK oligomerization, Cyt c/SMAC release from mitochondria and caspase activation, leading to cancer cell death (apoptosis). 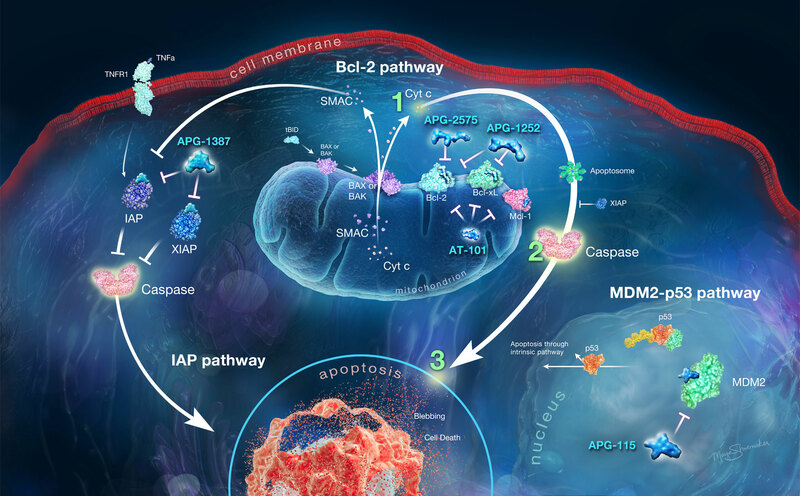 IAP Pathway: APG-1387 is a SMAC mimetic which can antagonize the function of cIAP or XIAP, which triggers caspase activation and leads to apoptosis. MDM2-p53 Pathway: APG-115 is a second generation MDM2 inhibitor that can block the interaction of MDM2-p53, thus stabilizing the p53 protein and allowing it to resume its transcriptional regulation function for the cell cycle and apoptosis.